A quirky, nostalgic send-up to the Oregon Trail computer game, featuring snarky and hard-earned life lessons from the trail. 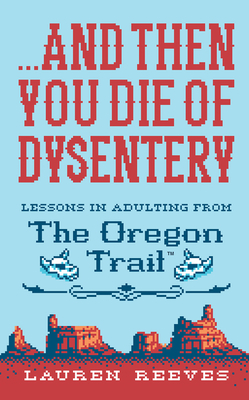 With its laugh-out-loud commentary and its absurdist nostalgia, ...And Then You Die of Dysentery is the ultimate trip down memory lane … all the way to the Willamette Valley. Lauren Reeves is a comedy writer, actress, and TV host. She was born and raised on a goldmine in Fairbanks, Alaska, leaving at the age of 20 for New York City. Lauren has appeared regularly on David Letterman and Jimmy Fallon, and has worked for shows including Comedy Central's @Midnight, TBS's The Detour, The Clio Awards and The Village Voice Pride Awards. She currently lives in Los Angeles with her golden retriever, Perci. He wrote this book, not her.